Analysing/searching your data and generating reports is one of the most important aspects of using software to follow your outcomes. Unfortunately, this aspect is often overlooked in the purchasing process and there are many examples where data has been trapped inside proprietary databases or is unable to be retrieved easily. The Socrates team have worked hard to create user-friendly reports and make data analysis and extraction as easy as possible. We also know that many of you don’t have Ph.D. qualified staff on site nor a statistician standing by. 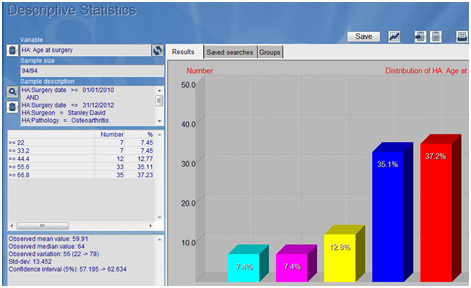 Most of our reports can easily be generated by any user who knows what they want. Search – This enables you to search for any field, score, or combination of in the database. This can either be used to search for patients in subgroups by name, or to select a sub group for statistics. Below is an example of a simple search – the user is looking for all primary THR’s of Dr Stanley’s with Osteoarthritis operated on between 1/1/2010 and 31/12/12. Descriptive statistics – there is a descriptive statistics package included in Socrates which enables you to easily generate descriptive stats on any fields and scores entered. The example below shows the mean and median age at surgery for the group selected above. There are a number of quick reports which make it easy to follow your patients either individually, or collectively. Below is an example of a patient in a shoulder instability group, their score summary and a visual display of scores completed, missing, or not yet due. This is group of patients in a THR follow-up group showing their preop and latest scores, and the difference between them. If you are planning to publish there will usually be the need to obtain the services of the statistician for more comprehensive statistics and comparisons between groups. All the data recorded in Socrates can easily be exported into a file suitable for use in a statistics package. It’s possible to create a report in a word document or PDF format based on the data entered into Socrates. This can include the patient’s responses to their scores and surveys, as well as the total score, intraoperative details, clinical examination, radiology – anything that’s been entered into Socrates for that patient record can be made into a document for export to the EMR or sending to other physicians. See attached for a report that was generated for a spine patient from their medical and spine history surveys, the modified Oswestry score, the VR 12 (SF 12 V1) which were completed by the patient on line. It also includes details from the physical examination screen which was completed by the surgeon .This report took around 25 seconds to be generated in Socrates, there was no dictation nor any other additions or intervention to this document. Once generated the report is initially in a text format and can be added to and modified as required by the user before being saved. It’s also possible to add, x-rays, logos and pictures to the document. We have done our best to make these reports as much like a normal report as possible, but it is still a computer-generated report. Our users who utilise this feature feel that the time saved, and that all these data are available for analysis more than compensates for the less loquacious format they would previously have used.